Thought for the Week: Ever tried? Ever Failed? I agree you could never win something the first time , you have to fail then try again. I read the thought of the week and I agree with that .!!!! It doesn’t matter if you try you can always try try again . I agree with this because if you are not good at something and you keep practicing, if you keep failing you can only get better if you keep trying until you succeed. I agree because it wants us to try our best until we achieve. I agree because it’s telling you to keep on trying. It’s also saying that you will fail in life but you will get better. I agree practice makes perfect if you fail you can suddenly get better ….. If you falied and you’ve bin told to re do your test and you fail again at least you know that you failed better. I think it means fail better and try again. I agree because if you practise you will get better. 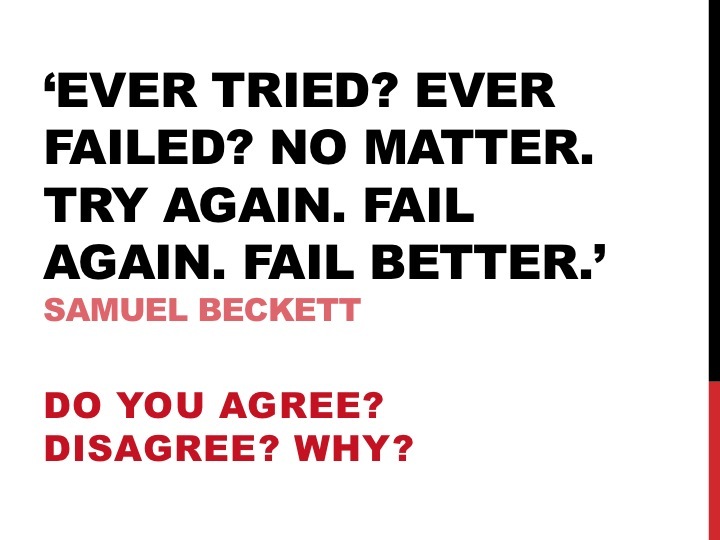 I disagree because you can either fail or pass , there is no such thing as fail better , but you can always try . I am actually Noor as hamin011. I agree with this statement because I think that if you fail at something you do it again and then you still fail, I think that you can fail better because you can learn from your mistakes. Folu. How could you know something was impossible without trying? Everything is impossible before we learn to do it!